The International Road Transport Union (IRU) is the world road transport organisation, which upholds the interests of bus, coach, taxi and truck operators driving the sustainable mobility of people and goods across the planet. IRU was founded in 1948 in Geneva to help war-torn Europe rebuild devastated trade and commercial links. IRU members are primarily national associations for passenger or goods transport. They include associations of truck, bus, coach and taxi operators, associations for a specific category of road transport, chambers of commerce and automobile clubs. 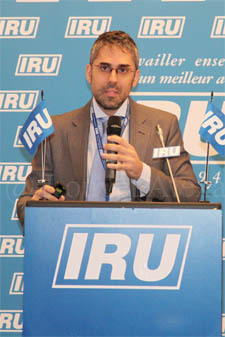 IRU also has associate members who are national and international not-for profit organizations"